How to Bake contains hundreds of recipes for cakes, cookies, pies, tarts, breads, pizzas, muffins, and other sweet and savory items. This new version of my third book has been fully revised and updated to reflect the way we bake now. Nick Malgieri’s Pastry provides recipes for all types of doughs and step-by-step photos about how to prepare them, roll them, shape them, and bake them. If you have ever had a bad case of “fear of pastry” or “fear of rolling,” just follow the simple instructions here you’ll be able to tackle any pastry project you like. Starting off with a quick tutorial on ingredients and equipment, we then delve into sweet tarts and tartlets; sweet pies, cobblers and crisps; savory pies and tarts; strudels; brioche; and puff pastries, including those with cream. With over 125 recipes, including a tutorial on Turkish pastries and Viennese strudels, Nick Malgieri’s Pastry is the new definitive pastry bible. Nick Malgieri’s Bread provides recipes and general instructions for the best bread that can be made at home with a minimum of fuss. This expert book is full of failsafe tips to get you through your first experiments with yeast and “turning” the dough. Working from the essential first building blocks of ingredients, equipment and techniques and taking you right through to the accomplished heights of slow-rise, two-step and sourdough, this is a masterclass from a master baker, complete with step-by-step photos for preparing doughs, as well as for shaping them. In addition to recipes that range from simple one-step breads and pan breads to more involved projects, such as making a sourdough starter, Nick Malgieri’s Bread also includes recipes for showcasing beautiful bread in savory and sweet dishes, including meatballs, soups, bread pudding and a vast array of sandwiches. This is the bread baking bible you’ll turn to again and again. After 30 years of teaching and 9 cookbooks, Nick Malgieri is finally writing the book he’s meant to write–a collection of over 30 essential techniques, and recipes derived thereof–outlining the easiest ways to learn the essentials of baking. The 20 chapters cover all the main techniques of fine baking, starting with simple pastry dough and moving through puff pastry and Danish pastry, to all sorts of breads, quick breads, cakes, and cookies. The 125 recipes will take all the intimidation out of baking and promise delicious savory and sweet results. Each chapter starts with an Essential Technique and master recipe, accompanied by concise step-by-step photography. Nick then includes Essential Tips before providing delicious recipes– with variations–based upon each Essential Technique. With gorgeous photography of baked goods sprinkled throughout, and a short introduction on ingredients and equipment, Bake! is the only resource you’ll need to become an accomplished baker. A collection of 150 simple step-by-step recipes that still have gourmet appeal, The Modern Baker strives to bring you baking success with the bulk of the preparation taking under one hour. 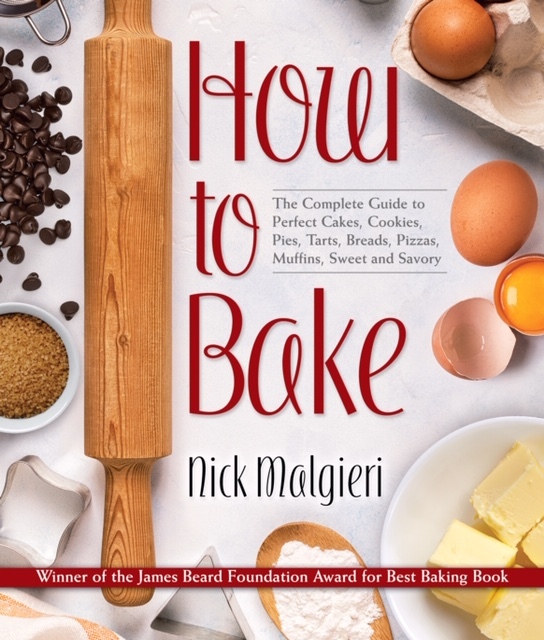 Nick Malgieri distills years of teaching and experience into these detailed recipes for virtually every savory or sweet yeast bread, quick bread, muffin, pastry, dough, and batter. Recipes are thorough and include descriptions of how batters and doughs are supposed to appear at each stage of preparation. The Modern Baker is as necessary and essential as a good oven; Nick Malgieri leads cooks through the simple art of creating an international assortment of delicious sweet and savory baked goods, interweaving techniques and helpful sidebars. Master baker Nick Malgieri and healthful food expert David Joachim have joined forces to create 125 exceptional desserts without the usual quantities of fats and sugars. The focus is on flavor and texture achieved through balanced ingredient combinations and superior baking techniques. Not a single recipe has more than 300 calories per serving. The results are nothing short of spectacular, with desserts that range from devil’s food cake (complete with fluffy icing) to a lemon custard highlighted with a colorful raspberry sauce. Old-fashioned American favorites such as hermits mingle with sophisticated treats like rum raisin semifreddo and white chocolate raspberry tartlets. The recipes use moderate amounts of real butter, sugar, flour, and eggs in perfect proportions. Every recipe includes a complete nutritional analysis as well as serving and storage notes. The award-winning master baker transports the world’s greatest kitchens and bakeries to your home with this inspired gathering of more than one hundred cookies, cakes, breads, sweet and savory pastries, pies, and tarts, from the baking tradition of thirty-nine countries. Look no further for chewy naan from India, rich chocolate Millennium Torte from Vienna, and crisp cannoli from Sicily. With A Baker’s Tour at your fingertips, you don’t have to tour Monaco for Prince Albert’s puff pastry cake, Poland for the lightest, most flavorful babka, or Argentina for perfectly seasoned beef empanadas — you don’t even have to go to country-specific cookbooks. The recipes here range from casual to sophisticated, and all have been adapted for American use, ensuring consistent, delicious results without sacrificing flavor. Supplemented by illuminating food facts and anecdotes, and illustrated with gorgeous full-color photographs. From simple to extravagant, the recipes are presented with the same clear, uncomplicated instructions that have made Nick a favorite among first time bakers and experts alike. You’ll find more than two hundred recipes for all types of cakes, from homey favorites such as Sour Cream Coffee Cake and Classic Angel Food Cake to luscious classics such as Dark and White Chocolate Cheesecake to international showstoppers such as Zuppa Inglese and Chocolate Raspberry Bûche de Noël. When the time comes to decorate or fill your cake, there’s a wealth of creative ideas, from working with marzipan to piping icing to flavoring ganache and buttercream. Also included are tips on selecting the most flavorful chocolates, fruits, liqueurs, and other ingredients. Tempting color photographs throughout the book will inspire anyone to head into the kitchen. Novice bakers will be reassured and experts challenged with Perfect Cakes, a comprehensive collection of perfect recipes and expert guidance. With more than four hundred recipes from around the world, Cookies Unlimited is one book that truly lives up to its name, offering delectable cookies both familiar and unusual, American and foreign, easy and elaborate. Malgieri’s bar cookies, drop cookies, refrigerator cookies, piped cookies, biscotti, fried cookies, and sandwich cookies are just some of the many temptations in this comprehensive treasury. Malgieri clearly and carefully describes fundamental techniques as well as advanced baking skills; from whipping up simple chocolate chip refrigerator cookies to piping perfect meringues to building a stunning gingerbread house, every technique is explained. Each chapter includes both easy cookies and elaborate ones, ensuring that bakers of all experience levels will find Cookies Unlimited useful and accessible. Beautifully illustrated with color photographs and instructional line drawings, Cookies Unlimited is an inspiring resource for every baker and cookie lover. Whether you are baking for the holidays, filling the family cookie jar, or even trying your hand at making cookies for the first time, this is the only book you’ll ever need. Nick Malgieri teaches bakers the hows and whys of pastry through basic techniques, from handling dough to poaching fruit, from piping meringue to caramelizing sugar. After outlining the proper equipment and basic ingredients, the book teaches readers to create a basic cream puff pastry, flaky doughs, sweet doughs, and cookie doughs. Step-by-step instructions are accompanied by photographs or line drawings for added clarity. Among the more than 200 recipes are Triple Orange Cake, Peach and Raspberry Cobbler, and Cranberry Pecan Pie, plus fondants, creams, caramels, glazes, syrups, and sauces for finishing and a chapter on decoration. 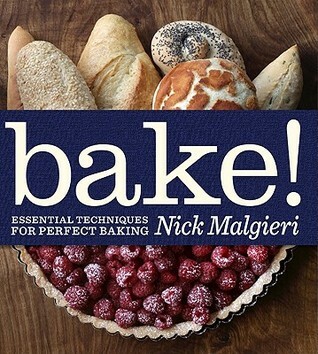 Nick Malgieri’s Perfect Pastry is the faithful companion to novice and advanced bakers alike. With the authoritative accessibility he brings to his teaching, Nick bridges the gap between the professional baker and the home cook. In ten chapters, Nick offers a primer on basics and every kind of chocolate from coca to chips and white chocolate (and why it isn’t really chocolate in the strictest sense) to big dark slabs of the world’s favorite luxury food and the many, many ways to enjoy it. Information on storage, handling, and the fundamentals needed to create chocolate confections is clear and concise. Recipe sections include everything you need to know to turn the food of the gods into desserts for us mortals: cakes and cookies, creams and custards, ice creams, pies and pastries, sauces and beverages, truffles and pralines, dipped and molded chocolates, all adapted for the home cook. Illustrated with color photographs throughout, all 380 luscious recipes will send a shiver of delight down the spine of every chocolate lover. Chocolate is definitive without being intimidating; it is a true home companion for anyone who wants to cook with chocolate. Here are the best recipes for breads, including such quick ones as Buttermilk Corn Bread, Irish Soda Bread, Classic Southern Biscuits, and Currant Tea Scones, as well as such delicious yeast-risen breads as Italian Bread Rings, Swiss Rye Bread, Challah, and English Muffins. Malgieri also offers recipes for savory treats like Old-Fashioned Chicken Pie, Pepper and Onion Frittata Tart, Cheese Quiche, and Rosemary Focaccia; and for sweet pastries ranging from puff pastries–Apple Turnovers, Banana Feuilletés with Caramel Sauce, Brioches, Strawberry Savarin, and Croissants–to pies and tarts, cobblers, and cookies of every stripe–drop, bar, rolled, and filled; brownies, macaroons, and rugelach. Cakes, too, are here, from layered to rolled, from angel to devil’s food. The recipes in How to Bake are clear and methodical. Master recipes explain all the steps to making a classic dish. They are frequently followed by creative variations so that the baker’s palate and skills will always be accommodated and challenged. Start out with a simple spice cake, for example, and transform it, under Malgieri’s reassuring guidance, into a lavishly decorated celebration cake. In addition to an exhaustive and tempting selection of recipes, Malgieri offers clear, detailed instructions, interweaving techniques and helpful sidebars: how to make a pastry bag out of parchment paper; what baking pans to buy; mastering pie and cake toppings; learning to decorate a cake so it looks as if it came from the bakery; and scores of other helpful tips. All this is punctuated with precise explanatory illustrations and thirty-two pages of luscious color photographs to inspire and guide the baker. How to Bake is a one-volume “bible” for bakers. Gelato, cannoli, zuppa inglesa, tiramisu – these are some the Italian desserts American have come to love in recent years. But there exists a world of Italian desserts that until now has been unknown outside of Italy. Nick Malgieri has drawn upon his own culinary heritage – that of southern Italy and the Italian-American bakeries of his childhood – and has traveled from Sicily to Milan collecting authentic recipes from professionals and home cooks alike. The result is a ground-breaking book of over 100 pastries, cakes, cookies and puddings that will introduce Americans to a dessert-making tradition to rival that of France or Vienna.